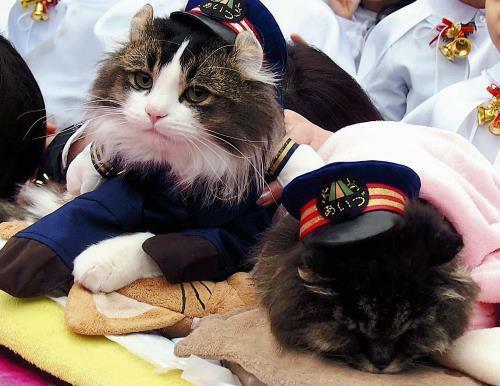 A young male cat named Love has taken the oath of office as "honorary stationmaster" at the train stop here. 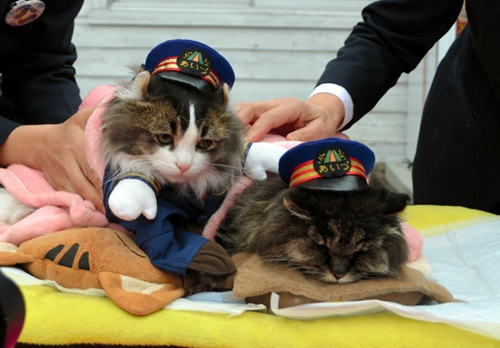 The cat, age 1 year and 8 months, took over the role at Aizu Railway Co.’s Ashinomaki Onsen Station from his predecessor, Bus, who has been forced into retirement at the approximate age of 17. Bus was deemed unsuitable for the job because, due to her age, she was catnapping frequently while "on the job" at the station. But the veteran feline staff member will continue to live in the station building. Love started serving as an "apprentice to the stationmaster" last summer by greeting passengers on the platform with his cute face. Love was "handed" a letter of appointment from Aizu Railway President Tadashi Oishi amid applause from fans from inside and outside the prefecture who attended the special ceremony on Dec. 24, 2015.